You can definitely reuse your old, factory installed OE TPMS sensors. Reusing your old sensors may be a money-saving choice at the moment, but actually can be quite costly in the future. The average life span of an original equipment tire pressure monitoring sensor is 5 to 7 years. This means that many drivers are driving with on the road with sensors that may expire in the very near future. Reusing your old sensors, only to have them stop working shortly after is an expensive and time consuming problem. Click here to learn more about why switching over to new, OE TPMS sensor replacements can save you more money and stress in the long run than reusing factory equipped sensors. Original equipment is the way to go. OE TPMS sensors boast a 5-7 year battery life, have a 1 in a million failure rate, and auto shops across the nation are more educated on OEM reset/relearn procedures, installation procedures, and compatibility. OE sensors are tested out before they are distributed and come with a manufacturers warranty. Information on OE TPMS sensors can be found from OEM retailers, car forums, dealerships, and auto shops. Aftermarket sensors have an inconsistent battery life. Some users report 30 days while some report 30 minutes. There is a lack of information and technical know-how regarding aftermarket sensors. The functions of the sensors are also inconsistent, with the tire pressure warning light coming on at random times and malfunctioning after air has been added according to vehicle specifics. We get this question all the time from our customers: Will original equipment tire pressure sensors fit on my aftermarket rims? The answer varies….Most of the time it’s yes. It really depends on whether your wheel brand has hopped on the TPMS train and started building wheels that are sensor compatible. TPMS has been the law since September 2007, and has since then been required to be factory installed on all new vehicles. Responsible wheel manufacturers who have gotten the hint have started to address previous fitment issues by rolling out rims that are TPMS friendly. To learn more about aftermarket wheels and OE TPMS sensor compatibility, click here. Nissan is well aware of the headaches that come with tire pressure monitoring. The segment leader has invented a much more user-friendly method of adjusting your tire pressure. The Easy-Fill Tire Alert is Nissan’s clever solution to making tire pressure adjustment a walk in the park. This innovative control module alerts drivers of individual pressure readings and which tires need special attention. The system initiates a horn-chirp when air is filled up to specifications, and chirps more aggressively when tires are overinflated. Click here to learn more about the Easy-Fill Tire Alert. Improve your Fuel Economy Today! The cost of fuel is reaching levels that many of us are having a difficult time keeping up with. The days of 1 dollar gallons are over, and drivers across the nation find themselves powerless under the guise of major gas companies. Break out of the cycle. Improve your fuel economy and save money at the pump NOW. Learn more here! Looking to replace your TPMS Service Kit? Did you know that everytime you remove a tire from the rim, the TPMS service pack needs to be replaced? Find out which service kit is right for your vehicle at TPMS Direct. Get the most out of your car and its tires by making sure your tire pressure is filled to your vehicle’s specifications. Tire pressure can be the difference maker in the overall performance of your vehicle, and if your pressure is low, you may not be utilizing your vehicle to its full potential. Air compressors and pumps are easily accessible. 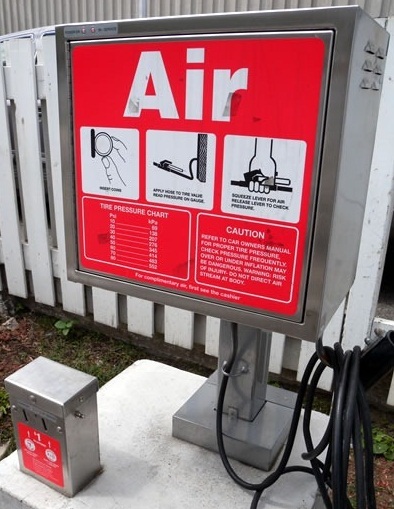 You can purchase a portable air compressor from your local auto parts store or you can fill your tires at the gas station. Some stations charge 50 cents for air, but sometimes you can get an attendant to turn on the machine for free. 1) Turn on the air compressor. You will hear the motor of the compressor working. 2) Remove the valve stem caps and place them somewhere visible or in your pocket. 3) Press the head of the hose down on the valve stem. If you hose has a lever, press down on it to release air. If it does not, simply push down on the hose until you feel air flowing through the hose into the tire. 4) Check to see when you have enough air pressure in the tires by releasing the inflation lever. The pressure gauge on the hose will indicate how many pounds of pressure are in the tire. If the tire is under the specified pressure, press the head of the hose back onto the valve stem and add more air until you have reached the specified amount. If the tires are overinflated, press down on the little rod inside of the tire valve to relieve pressure. 5) Adjust the pressure in the rest of the tires the same way. 6) After inflating all the tires, check the pressure in each one to confirm proper inflation. Adjust accordingly. 7) Twist valve caps back on valve stems. *Make sure you adjust the air pressure when your tires are cold or have had at least 30 minutes to cool down from previous driving. Try to make it a habit to check your tire pressure once a month. Doing so will increase the lifespan of your tires, improve comfort and handling, and increase your fuel economy. Above all, checking your tire pressure on a regular basis will help keep you and your loved ones safe on the road. Feel free to shoot us an email with any questions or inquiries you may have about tire pressure, road safety, and tire pressure monitoring systems.